You never know what’s out there, until you do. Whether you’re searching for affordable ways to scout land or if looking for the ultimate cameras to monitor and manage big game on your property, Moultrie’s industry-leading game cameras provide you with the optimal tools to gather accurate field intelligence. Learn more about the Moultrie Game Camera in the video below. 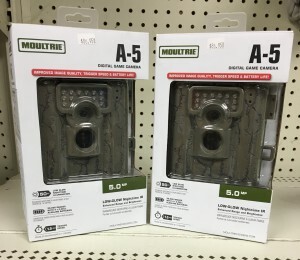 Mansfield Feed Mill has the A-5 Moultrie Game Camera in-stock. Moultrie’s A-5 provides easy setup and great features at a price that makes it affordable to outfit your entire property. Stop in today for deer corn and attractants to make your season successful! Please call us or stop by the store with any questions. This entry was posted on Friday, July 15th, 2016 at 12:59 pm	and is filed under News & Updates. You can follow any responses to this entry through the RSS 2.0 feed. Both comments and pings are currently closed.